Welcome to the town page for Hythe. Explore your town map to discover people who lived in your town during the First World War. Even before the First World War, Hythe was known as a military town, home to both the Royal School of Musketry and the Hythe Ranges. With the start of the war the military presence within the town expanded and came to include Canadian camps based at Sandling Junction. The Hythe Ranges were used as training grounds for different divisions including the Royal Flying Corps based in Dymchurch, and in 1916, balloon hangers were assembled which housed four balloons operated by the Royal Navy Air Service. The balloons would be picked up by ships on convoy and used as U-boat spotters as they sailed through the Dover Straits. The large number of forces and the military importance of the town meant that it was a target. It was raided by Zeppelins on more than one occasion, and was also attacked during the Great Folkestone Air Raid on 25th May 1917 when a total of 19 bombs fell on Hythe alone. As well as the threat from above, the Naval War fought upon the Dover Straits was also brought close to home. On 4th October 1915, the SS Enfield was mined whilst off Folkestone and became beached along the Hythe coast. Further inland, Hythe’s Royal Military Canal was lost as a recreational asset for the town as it was used for training and the elm trees which lined the water were felled to provide wood for the production of muzzle loaders. 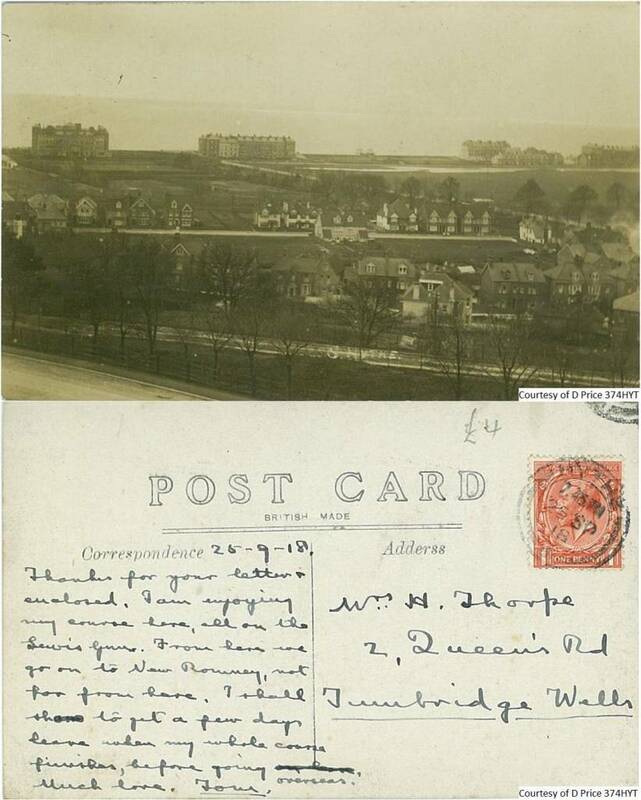 This postcard shows a view of Hythe and was sent 25th September 1918. We are not sure where Elsie fits into the Horn family, but she may be Fred’s Wife Evelyn. She is writing to the Horn family on behalf of one of the family. 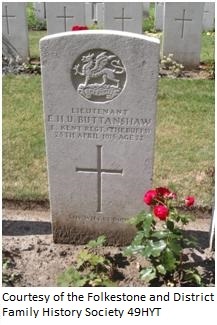 Edward Buttanshaw was an Army Lieutenant in the Buffs (East Kent regiment). His parents were Colonel Edward Thornton Buttanshaw of the Army Service Corps & Marjorie Evelyn D’aeth of Goodnestone near Dover. They married in Dover in December 1890. Col. Buttanshaw was born in Bengal, India so would have been born into an army family. Edward seems only to have had one sister, Evelyn May G. Neither are with their parents in any census and Edward is missing from 1891 and 1901. In 1911 Edward is at Sandhurst as a gentleman cadet. In 1891 his parents are living in Brighton & in 1911 they are in Rochester. Col Buttanshaw signed on for service in WW1 and didn’t die until 1954. His parents later lived at Scots Craig, Hythe though in later life they are shown on electoral rolls in London. They were probably wealthy enough to own two properties. Edward was Killed in action on either 25th or 27th April 1915 age 22. He is remembered on the Hythe Civic Memorial, the SS Peter & Paul Church Saltwood and at Ypes Reservoir Cemetery, Ypres, West Flaanderen, Belgium. Thomas Henry Cloke was born in 1876 and lived with his father John Cloke and his mother Louisa Cloke at 16, Albert Road, Hythe. Thomas was in the Navy during WW1. 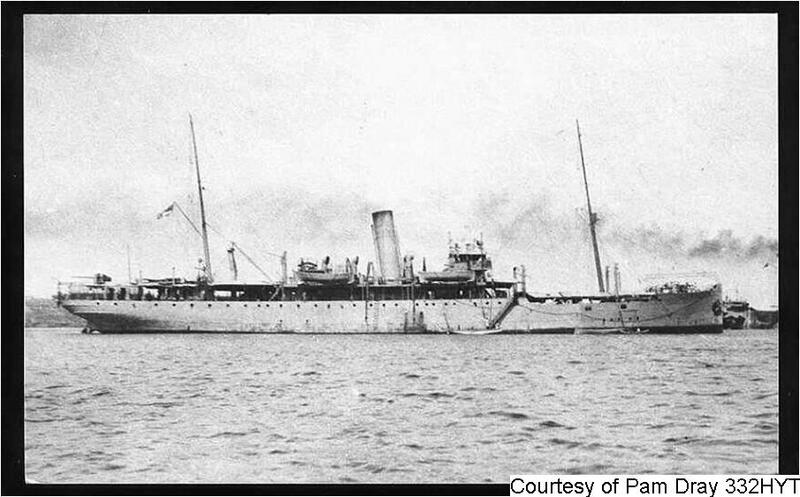 He served, 025172 on the HMS ‘SUVA’ (See Below) in 1916, which was a former Australian steamer that ran from Australia to Fiji. The ‘SUVA’ played a significant support role in T.E.Lawerence’s (Lawrence of Arabia) Arab revolt at the Arabian Peninsula, the ‘SUVA’ returned to the AUSN in 1919. Born in the March quarter of 1898 in Hythe, George was an Army Bugler 23954 in the 12th Field Company, Royal Engineers. George was the youngest of Henry Robert & Edith Mary Hayles sons & the first of the three who died. His family details are all given on the commemoration of his brother Albert. Strangely on the 1911 census he is recorded as George Henry and his elder brother as Henry Robert. This is clearly incorrect as his birth was registered as George Edward. At this time they were living at The Grove, in Dymchurch. George died of wounds on February 7th 1915 and is buried at the Cite Bonjean Military Cemetery Armentiers, Nord, France (IX.B.93). He is remembered on the Hythe Civic Memorial and at St Leonard’s School. Private Alfred Horace Dray (Son of John Dray and his wife Louisa Dray) was 22 years old and was born and raised in Saltwood. He worked as a Gardner when he enlisted at Lichfield, Staffordshire. He had been in the 2nd Bge RFA but had a free discharge, Private 11842 2nd Battalion Durham Light Infantry. Pte Christopher Cyril Dray L/10383 The Buffs, (Son of William Dray and his wife Ellen Dray.) was born in Saltwood on the 31st August 1894 and was the only son of William and Ellen Dray. Christopher was a baker by trade and eventually moved to 2, Warren Road, Folkestone before signing up. Sadly Ellen lost both her husband and son within 7 months of each other when Christopher died on the 15th March 1917 in France. At the time of his death, William and Ellen were living at 1, Avonshire Terrace, Horn Street, Nr Hythe where they received a medal for their late son. Image & text courtesy of Pam Dray. Henry and Albert Dray were two of five sons from the marriage of George and Sophia Dray. The family lived at Gate Cottage, Rectory Lane in Saltwood, Hythe, Kent. 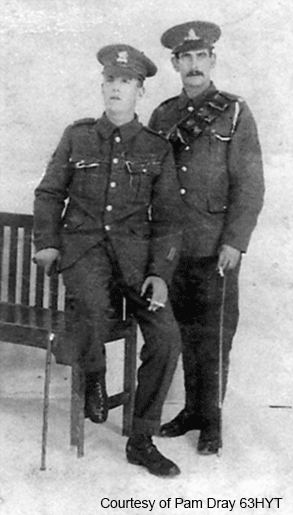 On the left is Henry Dray who was born in Saltwood in 1897. Henry was 19 years old when he enlisted at Canterbury on the 13th May 1915. His service record stated he died of wounds on the 2nd July 1918. Thomas was born in 1892 one of twelve sons from the marriage of James and Ellen Sophia Dray. 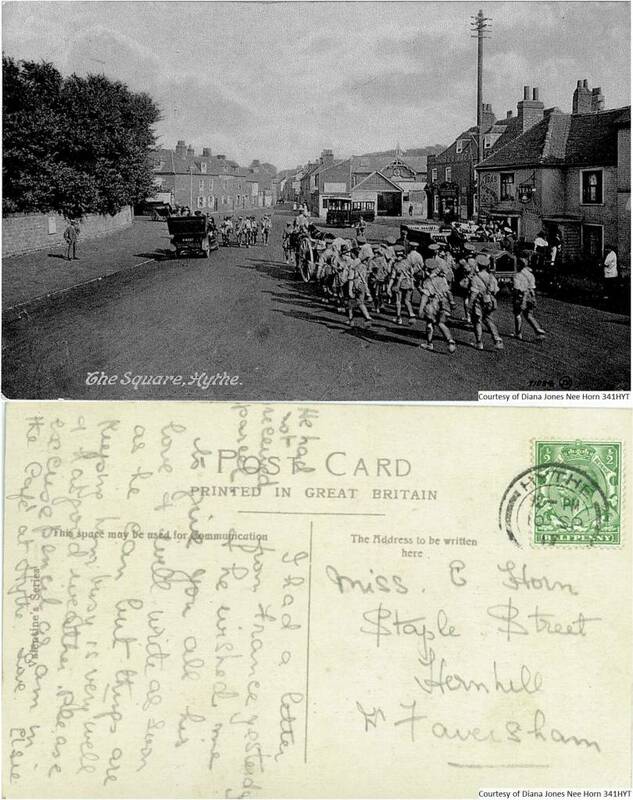 The family lived at 1, Albert Lane, Hythe Kent and Thomas was the only son not to return home from War. He died at Zonneke on the 11th April 1915. He is commemorated on his local war memorial in Prospect Road, Hythe, Kent as well as at his school St Leonards. His brother James was born in 1876 and led an interesting life. He enlisted 3rd January 1896 and had previously served in 1st Volunteer Battalion, Buffs. He did a Military Engineering course in Chatham 1899, a cookery course in Aldershot 1899, and a Master Cooks course in Aldershot 1903. James ended up with the rank of regimental Sergeant Major. His postings included three separate occasions to South Africa, between 1899-1908, Hong Kong 1908-1910, Singapore 1910-1913, India 1913-1914, a training reserve Battalion in 1916, BEF France 1918-1919 and in Germany where he transferred to Royal West Surrey Regt 1919-1920, Army of Occupation. When he was in South Africa his wife visited him from time to time and had two children born out there. He was discharged in 1920 due to Chronic Rheumatism caused by war service, and upon retiring he went back to Keymer, Sussex. He died in Cuckfield Hospital aged 83. • Edward Dray was born in 1874 and died in 1954. • George Dray, born 1879, Hythe, Kent, was in the Royal Field Artillery. • John Dray was born on the 26.3.1881 in Hythe, Kent. He was a Private in the 1st Buffs. • William Frederick Dray, born 1884 - 1960 as yet no record found of war service or exemption. • Percy Charles Dray, born 24.11.1886 Hythe Kent. On the 25th March 1916 it was reported in the local paper that Percy had asked for an exemption not to join the army, on account of he was the last single son at home and although working as a Labourer at the Camp he was also helping his father in his fish and chip shop of evenings also running the accounts. Capt Twopenny said that whilst recognising the splendid record of the family, Dray, being away all day, could hardly be indispensible to his father’s business. The Mayor then said he appreciated the grand example the family had set, and therefore he granted a month’s extension, with the following two months. I think there was also a twist to this tale as on the 16.4.1916 the last banns for his wedding to Mable May Browne were called and were married after that. I am not sure but it was believed he did go into the army at a later date. • Harry Dray, born 8.8.1886, Hythe, Kent, Number l/7966 2/East Kent. He made the Army his career and finished as a Colour Sergeant in the Buffs. He married Minnette De Silva in Bangalore India in 1919 and remained out there for the rest of his life. Harry was issued with the British War Medal in India 10.9.1923 in Madras being a Regimental Quartermaster Sergeant at that time. It is believed Harry stayed in India and died there. • Richard Dray, born 2/5/1894, Hythe, Kent, 855431 DVR 64 Bde Royal Field Artillery. • Fleetwood George Dray born 18.8.1895 Hythe Kent Number 14675 R.F.A of Hythe was 19 years 7 months when he enlisted in Dover in 1914 as a driver. His occupation at the time was a Hotel Worker. From his service records he went to France and whilst there he was awaiting trial 16.5.1917 but sentence was commuted to 24.12.1918 remainder of sentence 2 years I.H.L. 21.5.1917 and the sentence would be brought forward for reconsideration in September 1918. What was his crime? We did not find out. In his records was a letter from his father to the records office of the R.F.A in Oct 1917, saying he had not heard from his son in 6 months and wanted to know if he was ok. Various letters went from office to office asking about him and the last information was that the sentence was remitted and he was posted 20.3.1919. Fleetwood transferred to Class Z army reserve on 15th July 1919. He went on to marry Beatrice Simms around 1922 and they had a son Denis Fleetwood who lived in Solihull Birmingham. Fleetwood died in Solihull in 1970. • Frederick Bertie Dray, born 12/10/1896 -1953, Number 10091 The Buffs. Frederick was a greengrocer by trade living with his parents. He enlisted aged 18 years. 29.11.1913 at Shorncliffe, Folkestone, Kent and was discharged 16.1.1914 after serving 49 days. Stated on his discharge papers was: ‘unlikely to become an efficient soldier’. Apparently this type of discharge usually meant that he could not shoot straight or perform drill, (this probably saved him from getting killed in WW1.) Interestingly Frederick’s history sheet showed he had 3 elder brothers all in the 2nd Buffs stationed in Wellington, India, Madras. This procedure, of so many brothers in the same battalion, was later stopped in WW1 to prevent multiple family casualties in battle. 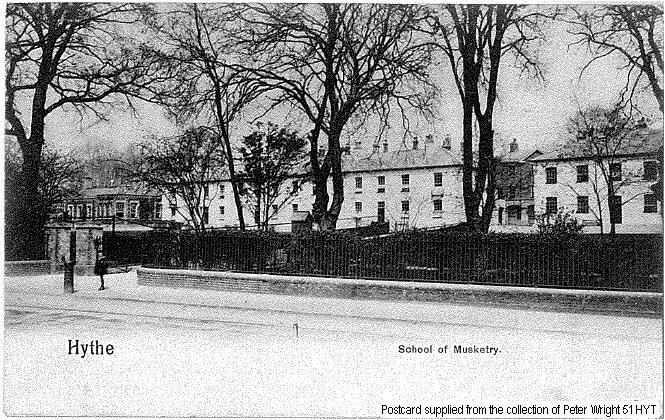 The Hythe School of Musketry was established in prior to the First World War, it is uncertain what date this picture is from but it shows the size of the facility which was situated along the banks of the Royal Military Canal and was an important establishment during the First World War.